If you are ready to start training with positive reinforcement, there has never been a better time to begin. Positive reinforcement training is all about training your dog without using aversives. And training this way, without force, has really taken off in the last few years. 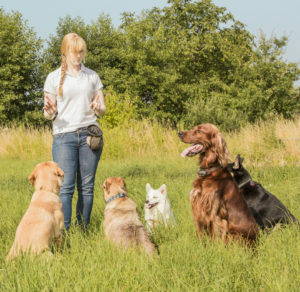 Lots of successful dog trainers are using these techniques and we are now seeing dogs succeeding in competitions and in all kinds of important service roles, having been trained with positive reinforcement. You might be a bit skeptical initially as to whether or not this can work. Especially with a large or strong-willed dog. There is no point investing time and energy into something that isn’t effective. If you are ready to begin, let’s just dive in. You’ll probably have in mind some skills that you want to teach your dog. Maybe you want him to sit and stay. To come when he is called and to walk nicely on a loose lead? These are all good goals to shoot for. But it isn’t just your dog that needs to learn. You’ll be needing some skills too. This is a learning process for both of you, and there are various ways to go about it. On the other hand, it is very important that your dog learns to sit on command at some point. And because it is important, it is difficult to say, “ Today I’ll teach my dog to sit – no pressure” because there is always pressure in achieving something worthwhile. There is a whole lot less pressure on you, and therefore on your dog, if you teach him something that doesn’t really matter. A pointless trick, a practice run, if you like, on which to cut your new trainer’s teeth and learn the new skills involved. So, if you have never trained a dog before, or have never trained without aversives or force of any kind, I suggest you learn the skills you need by training your dog to do something that doesn’t have any particular importance for you. This approach will help your dog too. When a dog does something you like, something you want him to do again, you’ll need to ‘mark’ that behaviour with a signal. This ensures that the dog knows exactly what it was you liked him doing, and what it is you want him to do more often. Once you are ready to mark great behaviours, you’ll need to catch your dog doing them! If you are not going to use force, or manipulation, if you can’t lead the dog about by his neck or push or pull him into positions, you are going to need some different skills. This is the most simple way to establish a new behaviour. You just wait for the dog to do it. And them mark it. Rather like a photographer taking a snapshot of a moment in time. Of course, capturing is only worthwhile if you want to establish a behaviour that the dog does often and naturally. Like a sit, or a bark. Luring simply means getting a dog to follow a bit of food with his nose. When the food moves, his nose follows. This enables you to move the dog into different positions. Luring is not a long term strategy – you won’t be leading the dog around with a sardine for the rest of his life. It is however, the most efficient way of establishing new positions that we have. Shaping is an elegant and very powerful process that involves ‘capturing’ approximations of a behaviour that you want, and moving the goalposts for your requirements in tiny incremental steps. Another useful skill to add to your repertoire as a trainer is the ability to target train. This simply means getting the dog to touch a designated object with a designated part of his body. It can be as simple as touching the palm of your hand with the tip of his nose. It may be necessary to use either luring or shaping, to get the target training under way. But it has lots of applications and is great fun! You can read a fuller explanation of target training here: What is target training? Whilst ‘dog trainer’ might seem a bit of an overstatement to describe someone that simply wants a well behaved dog. A dog trainer is in effect what you need to become. By following the system set out on this website, you’ll be able to turn yourself into a dog trainer in a very short space of time. All you need is a willingness to learn and to practice each day. The 5 skills listed above form the basis for establishing any behaviour that a dog is capable of carrying out, and it is important that you master them in order to be effective as a positive reinforcement dog owner. The great thing is, you don’t need any pre-existing skills, you don’t need talent, or a talented dog. The process is identical for every dog and every owner. Though of course how fast you complete the process will depend to some extent on your dog, and on your own proficiency. You will only get better with practice, and there is no time like the present to begin. So let’s get started And do come back and tell me how you are getting on!